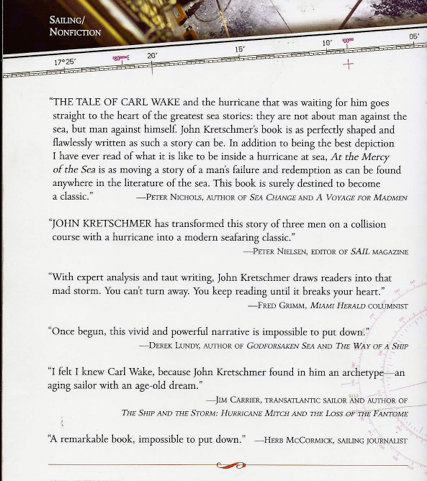 My Review: This story is about three sailors lost in a freak November hurricane in 1999. Well really, there were four sailors, but the fourth guy was crew and young and the author didn’t know him so I guess he doesn’t count, because he survived. 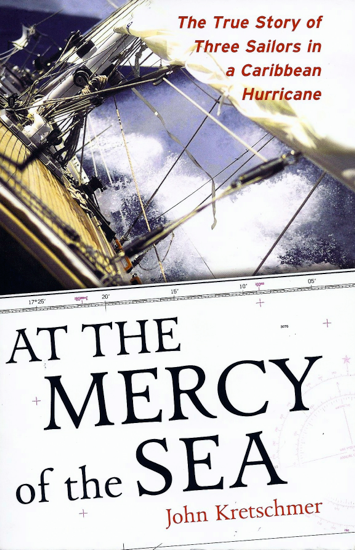 While there were three boats and three captains with various levels of experience, the author focuses most of his attention on one, Carl Wake. Carl was a man in his fifties who had dreamed all his life of long sea voyages in his own boat, some of them, single handed. The author befriended him and encouraged Carl in the pursuit of his fantasy. He helped Carl find and outfit a boat. He helped him learn how to sail it. And he agreed to meet Carl at the end of his first long off shore voyage to the US Virgin Islands. The problem with this book is that about two thirds of it is filled with Kretchmer’s mea culpas (I’m to blame) over what he sees as his role in Carl Wake’s death. For that reason and probably many others, the book is a little slow in getting started. But once into the narrative of the hurricane and what is happening on each of the boats, the story is quite gripping. One sailor miraculously rescues another in the teeth of the storm, only to have them both loose their lives when the second boat founders. Third boat goes down too and the captain dies when he is washed away, while his young crew mate struggles into a damaged life raft. All in all, it’s a good read and illustrates how sometimes in the game of life, you draw a fate card from which you cannot recover. But, given several of the other books reviewed here, this would not be the first one I’d pick up. For a better sailing tale see A Voyage for Madmen.